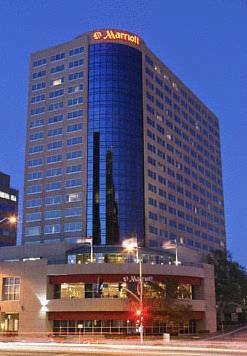 Kansas City Marriott Country Club Plaza offers a luxurious retreat for the modern traveler. Just moments away from popular destinations such as Uptown Theater, Sprint Center, Westport and the Kansas City Art Institute, our hotel offers a paramount location for business trips and weekend getaways. Discover ultimate convenience and take our complimentary shuttle service to Country Club Plaza. Our chic hotel rooms and suites are outfitted with free high-speed Wi-Fi and spacious workstations. Admire stunning views of the city or lounge around and watch your favorite shows on our flat-panel TVs. End the day by plunging into our plush bedding topped with soft duvets and plump pillows and peacefully drift off to a restful slumber. In the morning, wake up feeling refreshed and head to our on-site coffeehouse for an energizing cup of Starbucks coffee before a bustling day exploring Missouri. Whether you're in town for work or play, immerse yourself in a relaxing stay Kansas City Marriott Country Club Plaza. Main Street Grill: Main Street Grill puts a contemporary twist on classic American cuisine. We offer a diverse restaurant menu, a casual, inviting atmosphere, and an excellent location just steps from Kansas City's Country Club Plaza. M.I. Greatroom: Completely redesigned and renovated, the M.I. Greatroom boasts stylish design, cutting-edge technology, and creative food and beverage options. Our restaurant is a great place to unwind with friends or colleagues after a busy day in Kansas City. Cafe Express: Jump-start your morning in Kansas City at Caf Express, our on-site coffee house. We feature specialty Starbucks coffee beverages, freshly baked pastries, and a selection of snacks and light meals.